Effective September 21st, the Fair Credit Reporting Act (FCRA) requires a new notice of rights be included whenever a consumer is required to receive a summary of rights required by FCRA section 609. This addition added by the Economic Growth, Regulatory Relief, and Consumer Protection Act and according to an interim final rule issued by the Consumer Financial Protection Bureau. The new section, 605A(i)(5) of the FCRA was added according to this rule published by the Consumer Financial Protection Bureau on September 18th, 2018. The Bureau’s publication advised there was good cause for this interim final rule to be effective less than 30 days after publication to ensure necessary technical revisions were in effect prior to the effective date of section 301. According to their decision, this avoids the legal uncertainty involved with entities complying with both the regulation and section 301 at the same time. According to the rule, section 301 amends the FCRA to extend the minimum time from 90 days to one year that nationwide consumer reporting agencies must include fraud alerts in a consumer’s file under FCRA section 605A(a)(1)(A). 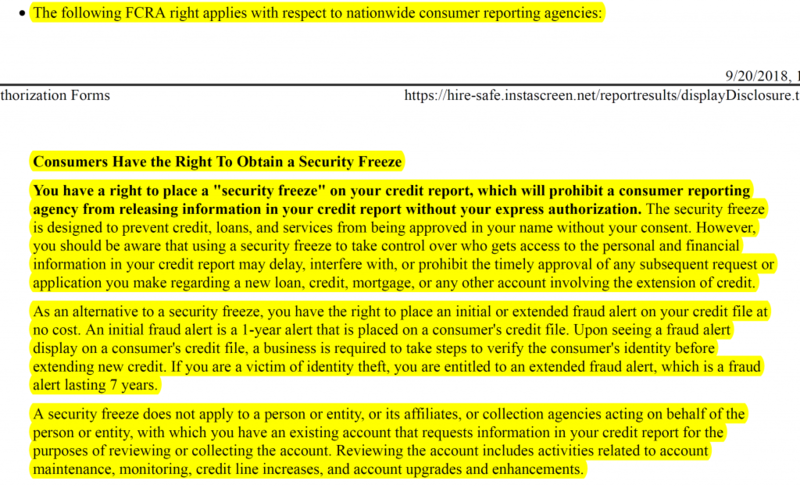 The addition to 605A via this rule includes a notice explaining consumer rights regarding a national credit freeze with the nationwide consumer reporting agencies and for an initial fraud alert of up to one year. What does this mean for HireSafe Clients? What do I need to do? HireSafe uses an electronic QuickApp via our partner TazWorks and the online process will automatically include the new notice in the required Summary of Rights. If you are a HireSafe client simply use the normal procedure via the HireSafe QuickApp included with our service! The highlighted text in the below screenshot shows the updated language! If you are not a HireSafe client, you can sign up for our services here but otherwise should discuss with legal council how you can become compliant with the changes to the FCRA. Email: FederalRegisterComments@cfpb.gov.Include Docket No. CFPB-2018-0025 or RIN 3170-AA82 in the subject line of the email. Federal eRulemaking Portal: http://www.regulations.gov.Follow the instructions for submitting comments. Mail:Comment Intake, Bureau of Consumer Financial Protection, 1700 G Street NW, Washington, DC 20552. Hand Delivery/Courier:Comment Intake, Bureau of Consumer Financial Protection, 1700 G Street NW, Washington, DC 20552.